PRODUCT DESCRIPTION: An odorless spray which has a bad taste and will repel nuisance animals and insects from treated surfaces. PRODUCT DESCRIPTION: Liquid that uses Federally Exempt actives making it not harmful and safe for use around the home and garden. It works by producing an odor and taste which is disagreeable to a wide variety of home and garden animal and insect pests including but not limited to: aphids, beetles, bats, chipmunks, crayfish, curly tails, deer, ducks, frogs, geese, iguanas, leaf chewers, lizards, mealy bugs, mice, newts, psocids, rats, rabbits, raccoons, scorpions, skunk, spider mites, snails, snakes, squirrels, thrips, toads, white flies and more. WHERE TO USE IT: Spray PEST-RID thoroughly in all areas where animal pests bask, feed, are seen or there is evidence of their presence such as droppings, claw marks or chewed plants. This includes areas around trees, shrubs, flowers, vegetables, walkways, docks, roof tiles, pool decks, or any place where control is desired. For ground dwelling pests, be sure to apply some PEST RID GRANULES first and then spray over the top with the Pest Rid spray for maximum protection. In the home, Pest Rid can be sprayed into attics, crawl spaces and other non living spaces where you need to repel unwanted animals or insects. Renew monthly. RATE OF APPLICATION: For optimum results on wet areas like pool decks, docks, patios, seawalls, irrigated gardens, and other large areas, a heavier saturation may be required. Initially applying liberal amounts will be most effective. A second, light touch up spray is recommended 2-4 days after the initial liberal application to reinforce the message that pests are not welcome. Animals are creatures of habit and since the product is a safe, natural deterrent, it can take several days to a week until the pests get the message. Re application is recommended to be done weekly till they leave. Once gone, treat every 3 to 5 weeks to make them stay away depending on the severity of the infestation and amount of rain. Quarts will cover 125 sq/ft; gallons will cover 500 sq/ft. Can this be used as a paint additive or topical only? If this isn't, is there a paint additive that repels sqirrels? As for topical treatments that work against squirrels; no doubt the Ropel on this page will stop them from chewing. But for a more "general" treatment (larger area), go with the Pest Rid. Its designed to chase them from the treated area (Ropel is designed to stop them from chewing) and this might suit your needs better. Plus, treatments will last a good month so its fairly persistent. Hi. 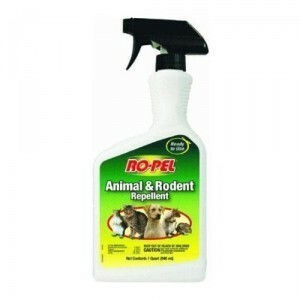 I own a pest control company in South Africa and would like to know where this product ROPEL can be bought. If its not available here, what product similar is available. At this time Ropel is not available in your country. And we're not aware of anything like it that can be acquired. 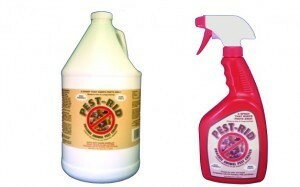 You may want to consider getting some of the Pest Rid too depending on your target animal. 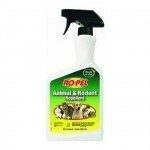 We find the Ropel and Pest Rid work well together. Does this product work on birds? Or if you don't want to have the spider hanging on your home, set up a Sound Repeller. Our unit has two setting that will work immediately and as long as the unit is in the right position and powered on.